Someone who knows a thing or two about interior design knows that the Barcelona Chair is the king of chairs. The chair has beautiful subtle details, which kept its design very simple. Everything from the shape, to the size, to every small detail is very well thought out. The choice for a color which emphasises the simplicity and class of this chair is an easy one for most people. To be precise: black isn’t a color. Black is the lack of color. Black doesn’t try to add something to the chair, but let’s the beauty of the chair speak for itself. Black gives the chair more class. Without claiming any of the attention, the black makes a statement. It adds a bit of mystery to every interior – makes every interior more modern and impressive. Black leather emphasises this. Black design makes a statement without screaming for attention. 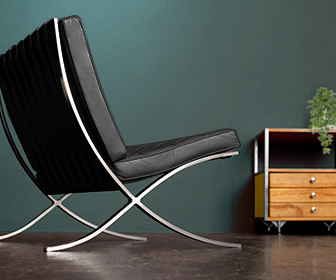 The black Barcelona Chair has everything design needs: subtle quality beauty. The classic version of the Barcelona Chair is the Lounge chair, which you see everywhere. But, you can choose for another version of the Barcelona Chair. If you really want to lounge you could choose for a Barcelona chair with Ottoman for example: a chair with a footstool in a similar design. The footstool is also available without the chair. If you think the chair isn’t enough, there’s also a sofa available in the same style as the Barcelona chair. And your last option is a Barcelona Chair Daybed: a daybed in the classic style o the authentic Barcelona Chair. If you choose for the black Barcelona chair, or for any of the other available designs, you can definitely combine multiple designs! A lounge area made up of multiple variants of the Barcelona chair black just can’t go wrong. The only thing you have to keep an eye out for is the space available. Rooms that are too full don’t give the black Barcelona chair the attention it deserves. A Barcelona Chair is an investment that will earn itself back, but buying one might not be an easy decision. The black barcelona chair will be in your house for the rest of your life. Original Barcelona Chairs barely lose value, so that’s a plus! The black version is also one of the version that gets a lot of love, so it’s definitely a smart investment for later. The price you have to pay for the original chair just isn’t for everyone. Remember that even Knoll has bought the rights to sell this chair, so if you buy from them you’re not dealing with the real original Mies van der Rohe designs. Knoll altered the dimensions of the chair, for example. You could choose to save up money to buy an original chair, but you can also choose to buy a high quality replica. When you’re picking out a replica barcelona chair, remember that you normally get what you pay for. The cheapest replica normally isn’t the best option to go with. But then again, the highest price doesn’t always guarantee the highest quality. Our favourite provider for replica barcelona chairs is BarcelonaChairShop.com. If you want to buy an original chair you can buy one at Knoll.